Monday: Get Your Kicks! Sculpt and tone a stronger core, bum, legs and back with a FUN martial arts inspired workout. You’ll get your cardio in there too, not to worry! Tuesday: Strength training! Let’s get back to basics with a full body workout using our bands and our own body resistance. The more lean body mass you develop, the more calories you burn at rest. Wednesday: Why run stairs? For starters, if you want to get back into your pre-pregnancy trousers quickly, I know of no better way to achieve this quickly than by running stairs. If you are a runner, stairs are a key component to your cross training regimen and can help you become less prone to injury and fatigue. As mums we are constantly bending down, picking up children, awkwardly lifting buggies onto the bus or tube, reaching for grocery bags with baby on hip, etc. It is imperative that you prepare your muscles and joints to withstand the physically draining nature of motherhood. If you are interested please email me by Tuesday. Thursday: who enjoyed our light cardio and yoga session to cap off the week last week? I know I did. You all had a beautiful glow leaving class last Thursday! Let’s plan on that again. Now that I am no longer pregnant or breastfeeding, this weekend I treated myself to a 3 day cleanse called Kaeng Raeng, meaning “be healthy, be strong” in Thai. For me it was a way to do a clean sweep of my insides after all the traveling and celebrating of this past summer. While I am not interested in losing weight, I have researched extensively the many benefits of cleansing; when done correctly it can help your skin glow, shed unwanted weight, help you feel light and energetic, and most importantly clear out your insides of all the toxins and junk that builds up over time and makes us prone to illness and a host of other unpleasant side effects. I have always wanted to try one, and with Brian away and no pressure to cook or eat out, this was my chance. It was not a difficult cleanse, I wasn’t choking down maple syrup and cayenne pepper, I was drinking 3 smoothies a day packed with all natural raw fruit and vegetable fiber, protein, probiotics, essential amino acids, vitamins and minerals. You are also encouraged to drink lots of water and eat as many raw fruits and veggies as your heart desires. Days 1 and 2 were relatively easy, and I didn’t feel much different. Day 3 was a totally different story for me. I was admittedly not looking forward to gulping down yet another smoothie, but I can honestly say I felt a new sense of energy and lightness that I had been reading about. If anyone is interested, especially if you are kicking off your Fall Fitness challenge, visit kaengraeng.com for more details. Speaking of jumpstarting your health goals, who is with me for the Fall Fitness challenge? Your bikinis may be tucked away in storage by now, but that doesn’t mean it’s time to hide under baggy sweaters and give up on feeling and looking your best. This challenge is a culmination of all of our 14- day challenges to date, and is open to any and all. So invite your friends, husbands, babysitters, whoever. Keep track of your own points and email me weekly for your chance to win 10 free Buggy Bootcamp sessions for yourself and 5 for a new friend! Obviously the real win here is to be your healthiest and happiest self, and feel more energetic and confident than ever by the time you’re slipping into your gorgeous holiday cocktail dresses in December. Our 10 week challenge begins Monday and will finish on 7th December. I will feature weekly recipes to keep you on the right track. Here is your first one! 1 dash of pumpkin pie spice (nutmeg and cinnamon is fine too)! Don’t forget to drink LOADS of water, get lots of rest (I know, I know, easier said than done with hungry little ones at 2am!) and treat yourself once a week! Start getting excited because if you see this challenge through to the end, you WILL see big results! To celebrate the completion of our fall fitness challenge we will plan a festive night of holiday cocktails and mocktails with the hubs/significant others. Details TBD and venue suggestions welcome! Don’t forget to email me if you’re interested and then continue keeping track of your own points each week! If you’re still reading this by now, you need to work on finding a better Sunday night tv show. Now go to bed and see you in the a.m.! I hope you all enjoyed a lovely weekend in London (or wherever else you may be!) Last day of summer- can you believe it? Aside from some nice easy workouts, a trip to the farmer’s market, scooter practice and a big Italian dinner at Sale a Pepe in Knightsbridge, we laid pretty low. Everyone seemed to need a break from all the rushing around so we just went with it. I look forward to hearing what you all were up to tomorrow morning! This week’s theme is “those last few kilos.” To lose a pound (about 1/2 a kilo), you must burn 3,500 calories. To lose one pound a week you must burn or take in 500 calories less than usual each day. If you are looking to shed those last few kilos, join us this week for 4 FUN calorie torching sessions. Monday: Tabata: you know the drill. 20 seconds high intensity all- out effort, followed by a 10 second rest period. on and off for 4 minutes. We will repeat this at each station for a workout that will keep your metabolism revved for the rest of the day! Tuesday: Plyometrics (also known as jump training). Watch your energy levels soar as you skip, jump, and side shuffle your svelte self through Hyde Park. We will be alternating between cardio drills and resistance toning. Wednesday: cue the Rocky theme music… stairs are one of the best ways to get fit FAST. We have plenty of combinations to experiment with on Wednesday so get ready to step it up. Thursday: Yoga and light cardio to end the week! 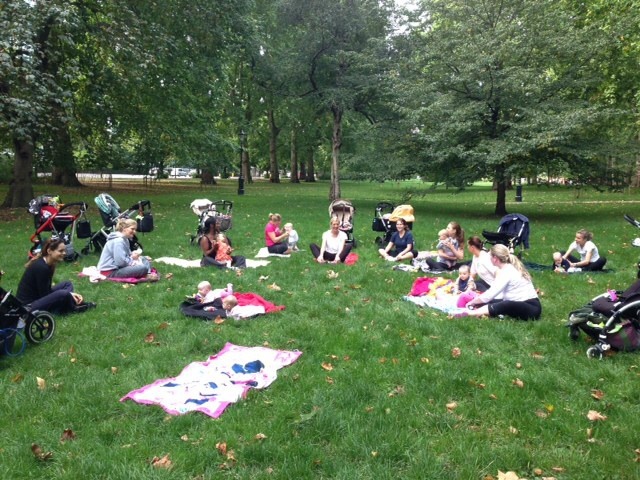 We will end each station with Asanas and get the babies out of they buggies for some group tummy time. Looking forward to seeing you all! I wish you all a full night’s sleep! We are back at my parents’ house from a fun but EXHAUSTING beach holiday. We had a constant stream of visitors, many under the age of 2, throughout the week. Lots of late nights and early mornings. We packed up the beach house this morning and somehow made it out of Newport alive and in one piece, three of us sleeping and one of us groggy eyed and driving. I deem it a success. Now I have to tell you about one of the coolest group fitness experiences of my life. Late last week my brother Jim and his girlfriend Bre convinced Brian, my other brother and I to wake up at 6am and join them at Harvard football Stadium for a workout put on by The November Project. Has anyone heard of this phenomenal grassroots workout in the US? Last November, these 2 Boston guys started inviting their friends to work out with them at Harvard Stadium as a way to keep each other motivated to stay in shape during the winter. Friends told friends. More and more people started hearing about it and had to check it out for themselves. Now the November Project has grown to epic proportions. Every Wednesday they hold an open workout for anyone who would like to join them for a morning spent sprinting up the entire length of bleachers at Harvard Stadium as fast as you can. Every now and then they would ring a cowbell which meant you had to get down and do either burpees or push-ups. We left feeling wobbly and humbled, but exhilarated! The guys who run it are hilarious and had us laughing the whole time. The vibe was so positive and the comraderie was awe-inspiring. I was completely shocked by the amount of people who showed up ready to work their butts off at 6 in the morning. There I am, in the 5th row down, with 100 other “newbies” after our first NP workout. Thank you to everyone who is doing the plank challenge with me! Great job with the daily check-ins! If anyone would like to hop on board for this week, just let me know! Who doesn’t want a stronger core, less backache, and perfect posture? Let me know and I will add you to our list. Thank you also for keeping me in the loop on what’s new with you and your little ones! I love love love hearing from you. Have a great week working out together and remember to drink loads of water, pace yourself, stretch, and pat each other on the backs for a job well done in my absence. dinners and visits with high school friends, college friends, work friends, and family. We are leaving Cape Cod now and driving to Newport where the friends and family circuit continues! Micky took his first steps last week and Cece is running off with her older cousins on the beach which was a real shock to me- she’s not a baby anymore and doesn’t need her mummy 24-7. Have any of your little ones been hitting any new milestones? How did everyone do on the greens challenge? Although I stuck to the plan to include greens at every meal, I certainly fell short in other areas (time to lay off all the celebratory drinks!). Increase your time a little bit every day! If you are interested in participating just shoot me an email and I will form our email chain by Tuesday. If you are doing a 10 pack or 3 month package I will be following up with 3 new workouts to stay motivated and super fit this week. Photos to come! Looking forward to hearing from you!